Our Garden Retreat at Shippan, Stamford, CT Show House! Containers planted with herbs. Check. Green wall hung and planted with ferns and Philodendron by our landscape partners, Eden Farms of Stamford, CT. Check. Moss birds on wall. Check. We’re gearing up for Wednesday’s press preview at the Shippan Designer Show House in Stamford, CT, where Victoria Lyon and I have been putting the finishing touches on our space, an eco-friendly garden retreat, greenhouse, and garden. I returned from Brooklyn last Thursday with a car full of wonderful things from one of my favorite garden shops, Dig, and got caught in a tornado! When the rain cleared enough for me to see where I was going, I had to navigate around the furniture and milk crates that had flown into the street. I am so lucky a tree did not land on me as one poor driver was not as fortunate. 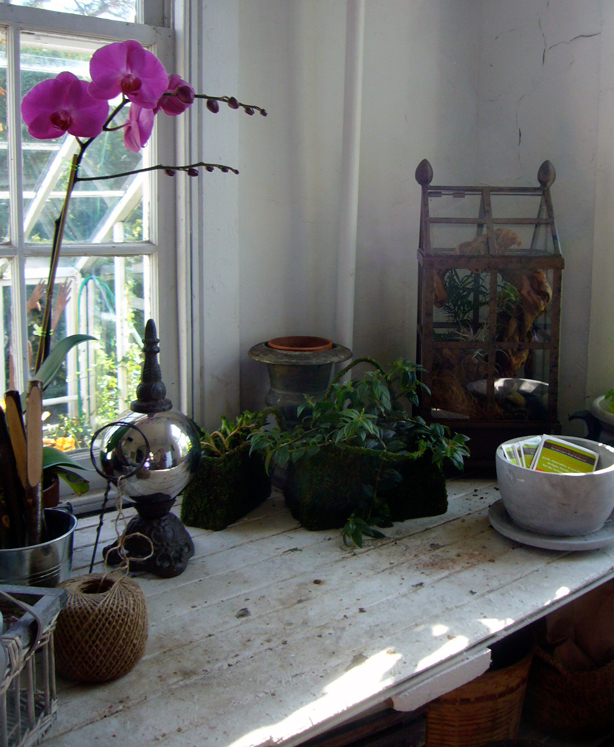 Setting up the potting table was so much fun. I love the stone coffee cup plant container that Dig’s Chuck and Maggie insisted we borrow from their shop. Nope, it’s not real. It’s a faux barnwood floor mat made of rubber. You can hose it off. How cool! ‘Twas the night before press day and all through the house, not a creature was stirring…and the guard dog stands at attention keeping the place safe. We have the tools hung above the gorgeous shelf of reclaimed wood our fab contractor, John Hone of Greenwich Property Management located for us. 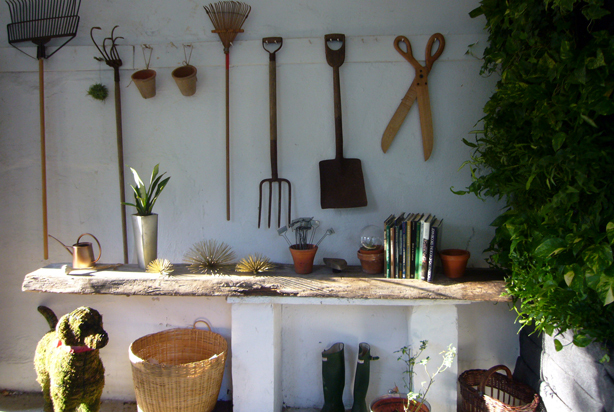 Our garden books are propped up supported by garden pot bookends. 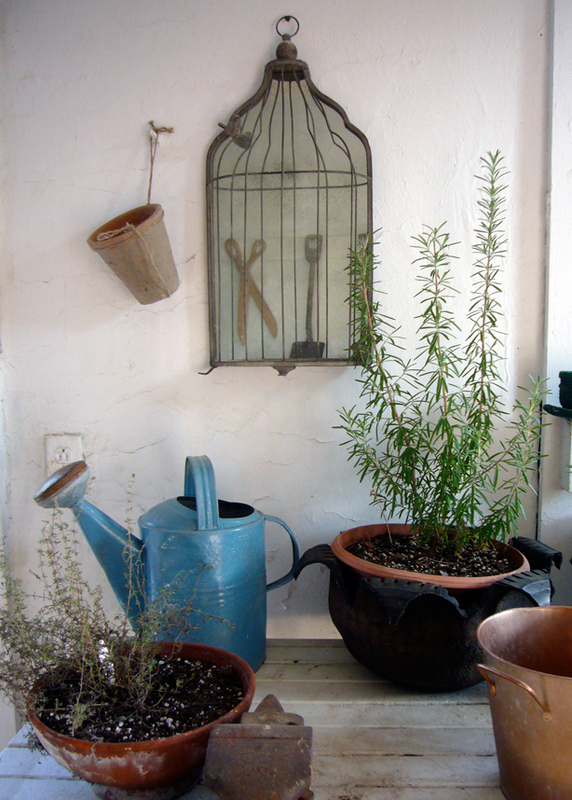 Loving the pots made from upcycled tires by Jill Colquitt of Duchess Craft; the blue watering can from Judy and Randy at Bluebonnet Fields Junk Shop in Texas; and the birdcage mirror and hanging pots from Barreveld. 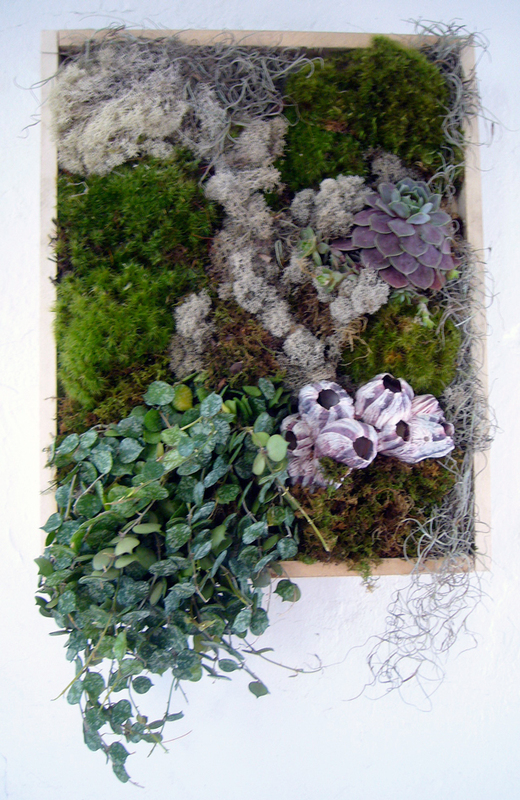 The live painting, or living frame as Brooklyn artist Kate Hill Cantrill calls her work, is created from Hoya (hanging), Vsempervivum (hen and chicks–the reddish bit), Sheet Moss, Deerfoot, Reindeer, and Spanish mosses, and barnacles. Kate is going places, I just know it. 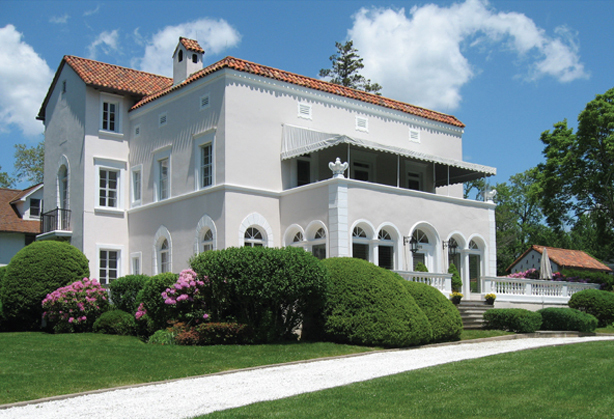 Shippan Point, 422 Ocean Drive West, Stamford, CT. The show house is produced by Franco Grimaldi of Talent Resource Centre and all proceeds benefit the Stamford Museum and Nature Center. Franco has produced over 30 of these show houses and I must say, has a talent for pulling off a challenging task. Designers include: Bartony Design, Beverly Balk Interiors, Bloomsbury Gardens, Deb Ryan Designs, Debra Geller Interior Design, Designs by Jennifer Owen, Judi Egbert Interiors, Jack Fhillips Design, Gosp Designs, Greenwich Design Architects, Greg Lanza Interior Designs, Kenneth Davis, Mary Delany Interior Design, Suzanne Bellehumeur-Mural Interiors, NuKitchens, Potomac Garage Solutions, Scaping Land Development Co., The Anacara Co., The Decorator’s Eye, Urban Gardens, Victoria Lyon Interiors.